If we could stop the clock, most women would stop it before they hit the dreaded menopause. Wrinkles, furrowed brows, crow’s feet (I prefer to call them chick’s feet), laughter lines, drooping and sagging all come neatly packaged together when we hit menopause – what woman would be excited for this?! When we reach menopause, we pray for a fountain-of-youth product to keep our skin supple and firm. Well lucky for you, StressNoMore have the fountain-of-youth range; Stratum C.
Collagen is one of the richest proteins found in the human body; it supports, strengthens and gives elasticity to our skin. As we reach menopause, our hormones begin to change making our skin less capable of producing collagen and retaining water, this results in dry skin needing extra moisture and the formation of fine lines and deep wrinkles – don’t succumb to these side effects! 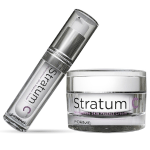 Stratum C provide a range of skin products that help to replenish youth to your skin; generating up to 70% more collagen to maintain plump, firm skin and bestowing a beautiful refreshed glow. The science behind this brand is that they use 6 powerful peptides that reproduce collagen, but also delivering essential nutrients and vitamins to keep your skin healthy, hydrated and best of all blossoming when you need it most! Reducing those wrinkles, laughter lines and crow’s feet by 45% in, wait for it – 28 days!! Every woman will want to know your secret! The Stratum C Protect Cream has blended with the 6 peptides natural Jojaba Oil and Apricot Kernel Oil; both of which are rich in vitamins A and E. These vitamins are perfect in nourishing the skin and help the skin to maintain hydration. The Stratum C Protect Cream is ideally used as a moisturiser and can be worn underneath your makeup to provide ultimate protection from those dreaded wrinkles! Stratum C Repair Serum is also blessed with the 6 peptides but is combined with high levels of Hyaluron which leaves the skin exquisitely rejuvenated, soft and glowing. Fused with the peptides and Hyaluron is the base gel that is created from an extract of rich Irish Moss Seaweed, this gives exceptional natural moisture and hydration. The Repair Gel is a fantastic daily facial treatment that should be applied topically to deep wrinkles such as the crow’s feet, laughter lines, forehead and glabellar lines (above the nose). These incredibly effective products help to create collagen by working with your skin and harmonising with your body. You will notice a significant reduction in wrinkles, a rejuvenated glow to your skin and noticeably looking and feeling firmer skin. These results you will see in as little as 28 days use! StressNoMore and Stratum C have joined forces so you can reap the benefits of the fountain of youth range; when you buy ANY product from the Stratum C range, we’ll give you the Stratum C Complete 4 Hand Cream for absolutely free *gasps* yep that’s right! Leaving us a comment on this blog – do you have any tips on younger looking/feeling skin? You can do all three, giving three entries and three chances of winning! After submitting your entry, make sure that you click on the “I’ve tweeted”, “I’ve commented”, “I’ve visited” button, so your entry is counted. Competition closes Thursday 12th of March at 4:00pm. The winner will notified by email, and must claim within one week. Offer open to UK residents aged 18 and over.